A top a bowl of Bubble Yum and Whopperflavored frozen yogurt, my 5-year-old son loaded gum drops, crushed Oreos, M&M’s, fresh kiwi and rainbow sprinkles — plus a squirt of marshmallow cream. He was in kid heaven. “That’s the beauty. You can make your own masterpiece,” says Froyo Earth owner Steve Kraft. Kraft opened his downtown self-serve frozen yogurt store last summer — and already plans to open northside, Valley and South Hill locations by the end of June. At Froyo Earth, customers choose from 10 different flavors of frozen yogurt and sorbets and more than 50 toppings. “You take and pay for no more than you want,” says Kraft. “It’s the right time,” he says. “Almost everything is gluten-free, hormone-free. Diabetics and weight watchers look on it favorably too,” says Kraft, whose motto is “treat well, be healthy.” Frozen yogurt is a good source of calcium and probiotics, the healthy bacteria that aids digestion. Sorbets, no-sugar added yogurts, non-fat yogurts, fresh fruit and proteinrich nut toppings appeal to consumers who are increasingly health conscious. But Kraft is not the only one on the self-serve yogurt bandwagon. Jim and Jennifer Heggenstaller opened Blu Berry Frozen Yogurt on Spokane’s South Hill last week. In Coeur d’Alene two self-serve frozen yogurt shops — Top This and Jamms — have opened within the last two months. Why the recent surge in popularity? “It’s identical to ice cream, but with a quarter of the fat and calories,” says Blu Berry’s Heggenstaller. All of the yogurt shops in Spokane and Coeur d’Alene serve frozen yogurt made by YoCream, a Portland company favored for its healthy yogurt and large selection of flavors from decadent Red Velvet Cake and Rootbeer Float to non-fat Peach Mango and no-sugar added chocolate. says many customers view frozen yogurt as a meal replacement. Her shop is popular with the breakfast crowd because yogurt is filling and satisfying, she says. Lunchtime is busy also, when customers fill up on pomegranate-raspberry sorbet with fresh pineapple or non-fat vanilla yogurt with granola and strawberry “snappers,” unique juice-filled toppings that burst in your mouth. “It’s going spectacularly and we’ve done no advertising,” says Combs. Top This is located about half a mile from Jaams, but “there’s room for both of us,” she says. “In Spokane, we’re a little behind the curve, but we’re coming along and people are really embracing it,” says Rick Purcell who opened the Chill Spot frozen yogurt shop on North Monroe last December. For 39 cents an ounce, you can treat a family of four for about $11, says Purcell. It’s an affordable treat and everyone leaves happy. But what happens in winter? Frozen yogurt is not the first thing that comes to mind when it’s snowing sideways and the mercury is stuck at 20 degrees. “People think I’m a little nuts – opening a frozen yogurt store during a snow storm,” says Purcell, but surprisingly, sales were strong. Many of the new shops around town are putting in fireplaces and serving coffee; Blu Berry’s plans to serve frozen yogurt with warm fruit toppings like apple and strawberry rhubarb: “Think of it like pie á la mode,” says Heggenstaller. Fred Etten, who opened Didier’s — Spokane’s original yogurt shop — 25 years ago, says winters are always tough. From November through February business drops off significantly, and that’s when serving burgers and other lunch items makes a huge difference for his business. Setting up shop with tempting flavors of frozen swirled treats and bins of gummi bears and chocolate-covered sunflower seeds is no guarantee of success. “Yogurt is an expensive product,” explains Etten. He was approached with the self-serve concept about five years ago, but concerns about cost control and hygiene convinced him to stick with the old fashioned method of serving his customers. “We do our own flavoring here, take care of the customers and try to do the best we can,” says Etten. The mom-and-pop shop’s sales have grown about 20 percent during the past few years. Unlike my son’s decadent yogurt concoction, it looks like the frozen yogurt trend won’t be melting away anytime soon. 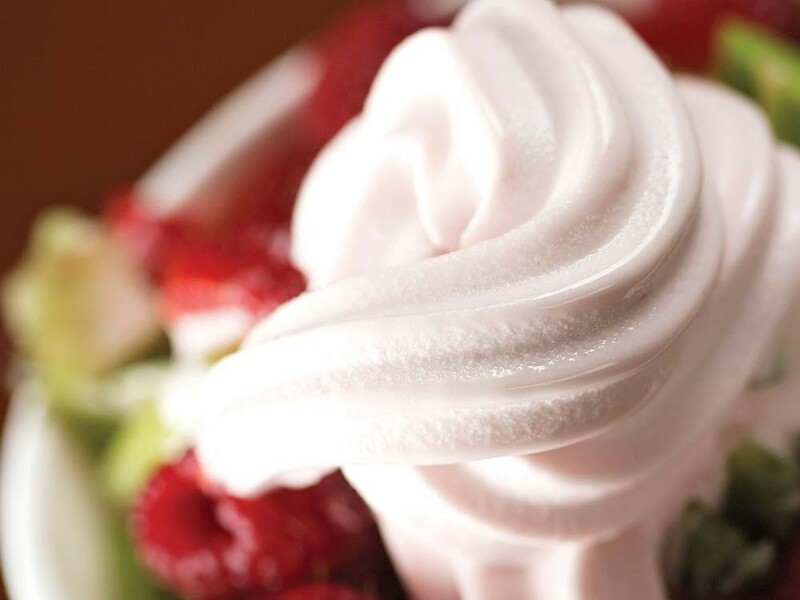 top thiS Frozen yogurt & trEatS: 202 W. Ironwood Dr., CDA (208) 676-1199.